Fed up with mangy sandwiches and cheese and onion crisps at lunchtime? 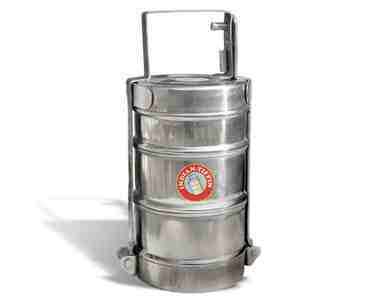 Right curry lovers, it could be time to get an Tiffin – the cool metal containers that keep food fresh. The containers – curry in one, rice in another, bread in the other maybe? – stack on each other and snap shut with a clasp. You can order online from Indian Tiffin, and better still readers of this site can get a 15 per cent discount off their first order until the end of February 2012 by entering the code ‘gcc15’. 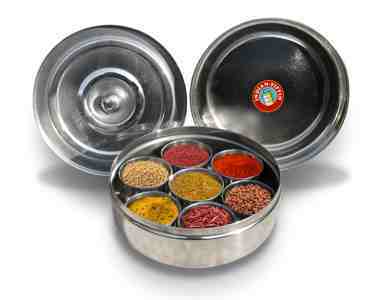 The site also offers other curry goodies such as dabba spice tins, whish keep your spices fresh and also makes life easier when cooking as your spices will all be close to hand. Or why not order organic spices or a roti making kit?